Gratuities are an awkward thing to discuss. Some people treat tipping a fishing guide as they would a hospitality service (which it is), and try to tip somewhere around 15-20%. Others feel more comfortable with a flat tip of $40-50. Certainly, there are others that tip well over that mark. Conversely, there are many that don’t tip at all–more than likely because it didn’t occur to them to do so, thinking that the fees covered everything. Many guides rely on gratuities to offset some of the associated costs of doing business. Guides use their own equipment on guide trips. If equipment is damaged, we can’t ask or expect a customer to replace or cover repair costs. 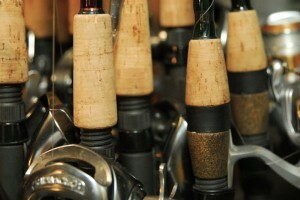 Rods, reels and lines all must be replaced periodically. Flies tied if it’s a fly fishing trip. Lures replaced if they get lost on a trip. Associated costs that are built into the costs of the business, but gratuities help ease that burden. On charter boats, in many instances, the first mate actually fishes for tips, drawing either nothing or next to nothing from the Captain. The Captains that I work with all compensate their first mates, but gratuities still make up the bulk of the day’s earnings. My guidelines are as follows when I fish with other guides (and I try to regularly to know what it feels like to be a customer). Bottom line is this: How hard did the guide/guide service try? Were they fun to fish with? How was their personality if things got tangled or the fishing was tough? Did they get frustrated at the anglers if there were blown shots or chances at fish? Were they in a rush to get off the water when “the time” came, or did they not seem to rush, and stay out for a bit? And lastly, how much overall effort was put forth to ensure the customer[s] had a great time? In the end–please tip what you feel comfortable with. Everybody’s finances are different, and there is really no expectation of a certain dollar amount, but any tip is certainly very much appreciated.